This is blooming in my backyard right now! It's a shurb that my grandparents planted years ago. 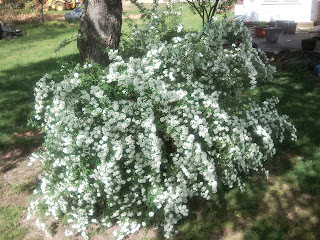 My grandmother always called it bridal's veil bush. 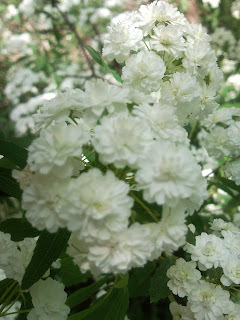 But when I went to college, I learned that is was some type of Spiraea sp. It is the double flowering variety of Spiraea cantoniensis. It is an early to mid spring-blooming shrub that bears clusters of many-petaled white flowers atop its bluish green, toothed leaves that hold late into the fall. In the Deep South, these leaves may persist through winter. S. cantoniensis has graceful arching branches making it a popular choice for gardens and shrub borders. Its flowers also attract butterflies. I love this shurb! It is so graceful and delicate looking yet it is tough as nails. S. cantoniensis is a drought tolerant plant that is pretty much a carefree addition to anyone's garden. 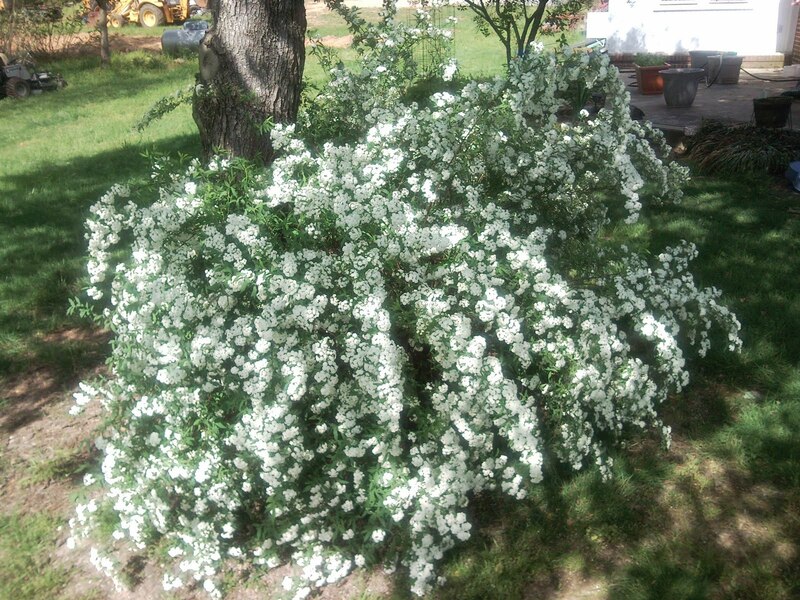 These Spiraea make great borders and can get up to 6 feet while spreading to around 4 feet. They like full sun but will tolerant shade. Mine is under the base of a Acer rubrum (Red Maple) and as you can see is doing great! S. cantoniensis is hardy from zones 5 to zones 6. Click here to find your hardy zone. The S. cantoniensis 'Lanceata' is a rare Spiraea. It is one that is not seen very often it is usally confused with other double blooming Spiraea. Thanks for coming by! I'll be following your blog and can't wait to try for some of your awesome giveaways! There are a couple my boys would love!